Good quality, inexpensive sponge to clean short pips rubber. Compact and simple sponge to clean rubber. Recommend to use the lighter side of the sponge to clean the red side rubber. Just a very good sponge. Made in Japan. 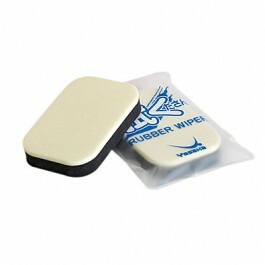 Excellent product with a hard and soft sponge for a thorough cleaning of your rubber. A necessity for all TT players. Хорошая губка, но черная сторона больше пол года не проживет. Products delivered in good conditions and great prices too. Very nice Tabletennis11. Best sponge I used but it does not last that long. The black side is already degraded but I can still use it. For the price I bought more than one so I should be OK for several months! It cleans well, nothing to complain. Perfect Product, i recommend to everyone! A good sponge for cleansing the blade during training, does not take up much space, it performs its functions. Easy to carry around, well built. But I just don't know the purpose for either side. A little hard to clean the rubbers with the spray cleaners, as it doesn' absorb water well. I found the large block spounges are much better. Отличная губка очень мелкопористя, если есть деньги на нее, то берите, штука шорошая. It does job very well, more durable than big yellow ones. Also much more durable. And you can carry it easily. Not good product, try other company product. Clean the rubber with the soft side, and remove the dirt with the hard side - that's the way to do it. Not like the usual sponges that just move the dirt on the rubber around and let it dry. I use this sponge with clean water and it's brilliant. Last long, and smaller in size. perfect for cleaning the rubber. These cleaning sponges are very good. Cleans the rubbers very good. Seems like it may last a long time. Great workhorse to clean rubbers. Comes with two sides (white and black) - one of them can be used to spread the cleaning solution and the other to wipe the rubber. Good price, good product. Recommend highly. Удобная, хорошо чистит, есть кармашек для хранения и переноски. One of the best ones out there. Two sides for cleaning and screeding. I like the soft plastic storage sheath. Durable and Recommended. I clean rubbers only with water. The sponge soaks up enough water to clean the rubber,and the squeegy back get the excess water off fairly well. Это очень хорошая губка,одна из лучших. This yasaka sponge is better than Butterfly. Это мягкая,качественная губка для протирки накладок,очень изноустойчивая. Haven't tried it yet, but great price! я много товаров заказывал через ваш сайт. это были товары высокого качества и быстрой доставки. Это очень хорошая губка, мягкая и очень износоустойчивая. Отличная губка. Хорошо снимает грязь. Доставка как обычно в кратчайшие сроки. It works as advertized. I think that the white side is for cleaning, the black side is for drying. Correct me if I am wrong. I helped a friend to buy this, so I will help him to review it. Every time he cleans his racket with this sponge, he has this satisfaction look on his face - regardless if he had just won or lost the match. So, it must be the sponge! That's 6 stars quality in my book. Это очень качественная губка, очень износоустойчива. Всем рекомендую! Great item. Love how it has two sides, one for distributing the cleaning fluid on the rubbers and the other side to wipes and dry the excess. A must buy item to go with the cleaning bottle. It cleans and durable after several use compared to some sponges that I have used before. Very good sponge , durable and priced good, better then nittaku. Do not look for anything else than this cleaning sponge than this one. Very soft touch and high quality sponge.